At the moment I could eat roots and turnips all the time luckily, as tasty spring vegetables are still a few months away. It’s always the same, around March I start to miss ripe tomatoes, juicy cucumber, crunchy lettuce, zucchini, the ripe tastes of summer. Greenhouse vegetables reach their watery peak at this time of the year so they are not really an alternative. The cherry tomatoes I bought the other day had thick skin and when I ate them I had to image tomatoes rather than tasting them. I don’t really feel like cabbage anymore, so I stick to everything that grows in the ground. I enjoyed my Monday’s Ginger Honey Navet Steaks so much, their sweet, syrupy juices were delicious, that I thought about other combinations of roots and syrup. 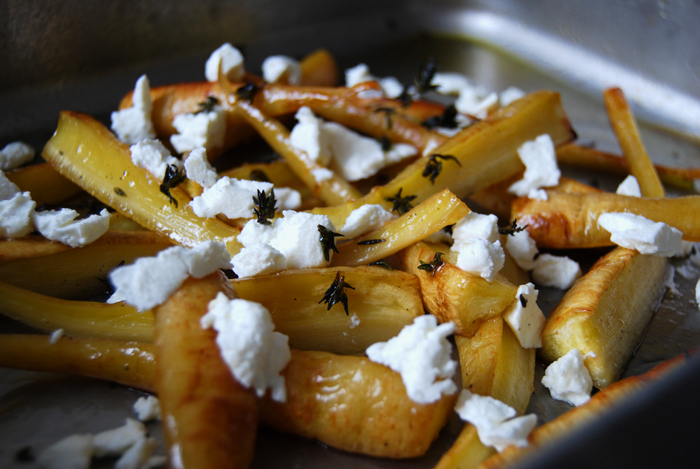 My choice was caramelized parsnip roasted with maple syrup and thyme leaves, combined with fresh goat cheese in a warm salad. The juices make a great thick syrup, glazed around the roots they are a perfect match for the milky cheese crumbs and strong wintery herb. You could make it as a side dish, still hot, we ate it as a warm salad, I didn’t want the cheese to melt. I cut three parsnips into long strips and glazed them with 3 tablespoons of olive oil and 2 tablespoons of maple syrup mixed with salt and pepper. A dash of white wine and the leaves of 4 sprigs of time on top, everything well spread in a roasting tin, I baked it for 15 minutes in the hot oven set to 200°C / 390°F, Rotitherm roasting setting. 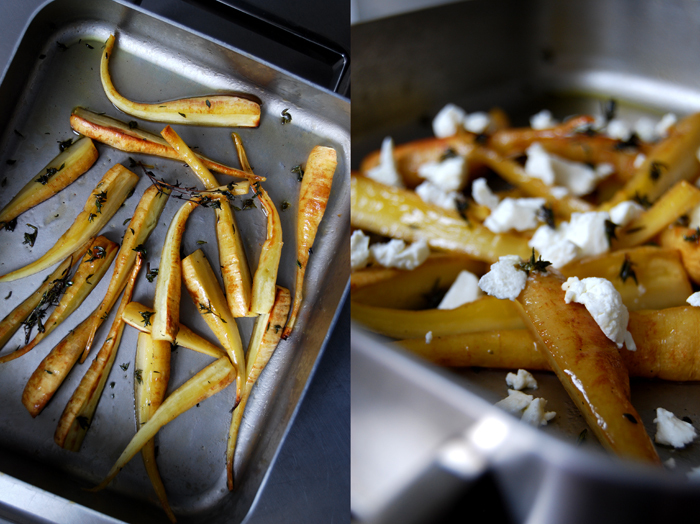 When the parsnip was done, golden on the outside and soft inside, I let them cool for a couple minutes before I crumbled 80g / 3 ounces of fresh, soft goat cheese over the roots. The two us cleaned the tin with our fingers, not to waste a drop of the sweet syrup. Oh, that sounds like a delicious combination. 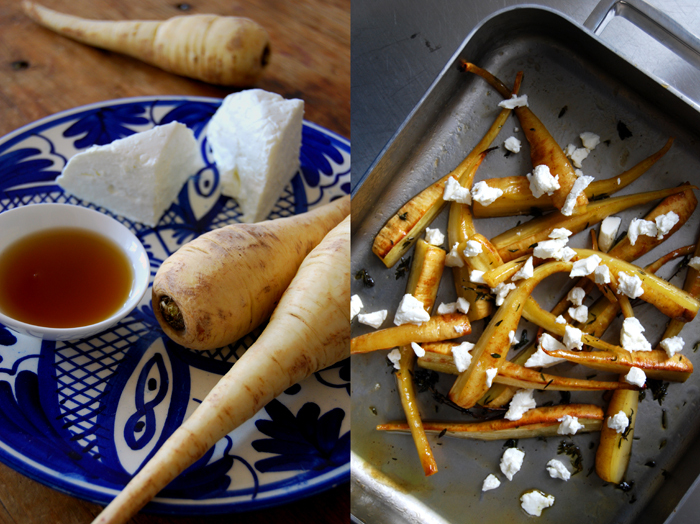 I love parsnips, but don’t buy them often, as I am the only one that appreciates them.